Fish oil and garlic are both associated with multiple health benefits, including lowering blood pressure and LDL or “bad” cholesterol, and otherwise lowering your odds of heart disease. Fish oil and garlic can both be consumed in food and pill form, though to use one or both as part of an aggressive program of heart disease prevention, you would probably want the greater concentrations afforded by supplements. Fish oil and garlic are each effective, but they may be most beneficial when taken in tandem. Fish oil, whether ingested in salmon or other coldwater fish, or in pill form, is strongly recommended for heart health. Fish oil helps lower your blood pressure and triglyceride levels, according to the Mayo Clinic. Your triglycerides are fats that help make up your total lipid profile. By lowering your triglycerides you reduce your risk of atherosclerosis and other complications caused by dyslipidemia, an abnormal lipid profile. Fish oil supplements can cause some people to burp and have a fishy aftertaste in their mouth. Likewise, garlic consumption is associated with lowering blood pressure, LDL cholesterol and reducing platelet aggregation or the clumping together of platelets of blood, which is a major risk factor blood clotting. 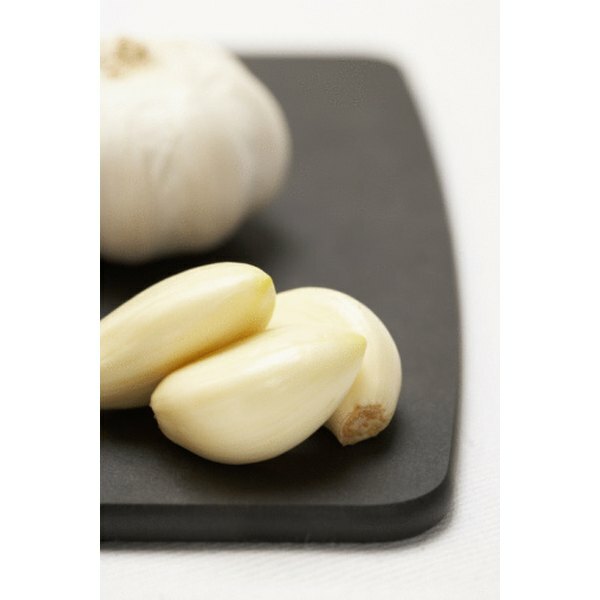 Garlic is also thought to be protective against certain forms of cancer and as a means of boosting your immune system. As you might expect, garlic supplements carry an aftertaste of garlic and may leave your breath with a little garlic scent. But it’s nothing like you would face if you had a meal that was heavily seasoned with garlic. Garlic and fish oil supplements are sometimes packaged together to give your heart health an extra boost. In a study in the February 1997 issue of the “American Journal of Clinical Nutrition,” researchers found that, in a test comparing the effects of fish oil alone, garlic alone and the two supplements combined. The study determined that the combination of garlic and fish oil in a single supplement did the best job of lowering LDL levels, triglycerides and raising HDL cholesterol out of all the ingredients. While the effects of fish oil and garlic, either in combination or by themselves, are strongly associated with improved heart health, these supplements should not be looked upon as absolute replacements for proven and tested medications. If you have been diagnosed as having heart disease, you should follow the advice of your doctor, rather than simply taking a few herbal supplements. Can Garlic Lower Blood Sugar?